Cast your mind back to May. The Gulf of Mexico oil spill was at its peak and when it looked like all was lost, one man stepped forward with a ground-breaking solution – Kevin Costner. Costner, famous for starring in films such as The Untouchables, Robin Hood: Prince of Thieves and Field of Dreams, announced that his company, Ocean Therapy Solutions, had developed a technology that could separate oil from water. The device apparently worked so well, that BP ordered 32 of the half-million dollar centrifuge machines for use in Gulf cleanup operations. However, Costner is now facing legal action from another member of Hollywood’s elite – Stephen Baldwin, over the ingenious invention. Baldwin, brother of Alec, William and Daniel and star of The Usual Suspects, is claiming that he was “duped” into selling shares in Ocean Therapy Solutions just as BP was about to invest in the firm. As a result, he has filed a multi-million dollar lawsuit against the Waterworld star. Baldwin is claiming he was forced to sell his shares and is claiming more than $4 million in damages while his fellow claimant, Spyridon Contogouris, is asking for more than $10 million. Both Baldwin and Contogouris were found as investors in April 2010 as Ocean Therapy Solutions was formed to market the centrifugal devices to BP. Baldwin and Mr. Contogouris allegedly purchased 10% and 28% stakes in the company respectively. They claim they were then forced to sell their stakes at the time the company was finalizing a deal to lease 32 of the machines to BP for approximately $52 million. With the legal battle set to go to court, it looks like Costner and Baldwin are set to go head-to-head over Ocean Therapy Solution’s profits over the oil separating technology. As for how it performed in the Gulf? According to BP, the devices were “hardly used” during clean-up operations and have since been dismantled. 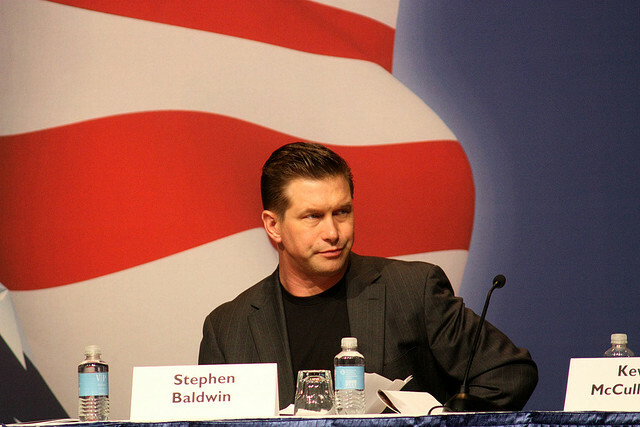 I don't know about the merits of the case, but calling Stephen Baldwin a "member of Hollywood’s elite" is quite a stretch. Cast your mind back to May. The Gulf of Mexico oil spill was at its peak and when it looked like all was lost, one man stepped forward with a ground-breaking solution - Kevin Costner. Costner, famous for starring in films such as The Untouchables, Robin Hood: Prince of Thieves and Field of Dreams, announced that his company, Ocean Therapy Solutions, had developed a technology that could separate oil from water. The device apparently worked so well, that BP ordered 32 of the half-million dollar centrifuge machines for use in Gulf cleanup operations. However, Costner is now facing legal action from another member of Hollywood's elite - Stephen Baldwin, over the ingenious invention.